Back in the old days it was called My Computer, and everyone was fine with that. Even if you were on someone else’s computer, and it wasn’t your computer, you were still OK with My Computer. Then later, Microsoft, thinking that calling it My Computer would make people think every computer was their computer, dropped the My and it became Computer. Alas, all the old people got booted out of Microsoft — because they’re weren’t making enough money — and some guy whose name I can’t spell took over, hired a bunch of new people and they’re cooler than the old people. Now it’s not My Computer or Computer, it’s This PC. This PC is My Computer…a rose by any other name, you know. Now what’s my point? 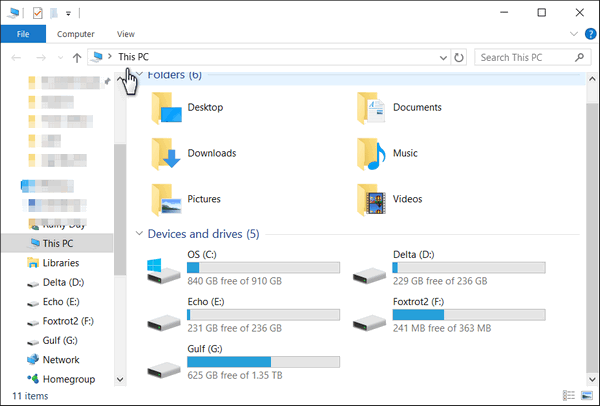 My point is that when you click “File Explorer” (Windows Explorer’s new name in Windows 10) you won’t see your drives in the default File Explorer view, you will see the Quick Access menu. Quick Access is pretty cool, but I think it’s way cooler if you can see both your Quick Access items and your drives — hard drives, usb drives, dvd/cd drives, external drives — in the same window. As for Quick Access, well it’s sort of like Libraries, and it’s pretty handy, but for the sake of brevity, we’ll save that discussion for another time. We’re going to show you how to change File Explorer so it opens up with Quick Access and This PC (formerly known as Computer and My Computer). And it’s very simple. It’s so simple in fact, you’ll be able to do it faster than you were able to read this tip. Note that will open to “Quick access” (highlighted in yellow below). Let’s change this so it opens up to This PC (My Computer/Computer). In Folder Options, next to “Open File Explorer to: ” use the down arrow to select This PC. Then click Apply/OK. Behold! It’s My Computer/Computer/This PC – just like it used to be in days of old. See? Look up. 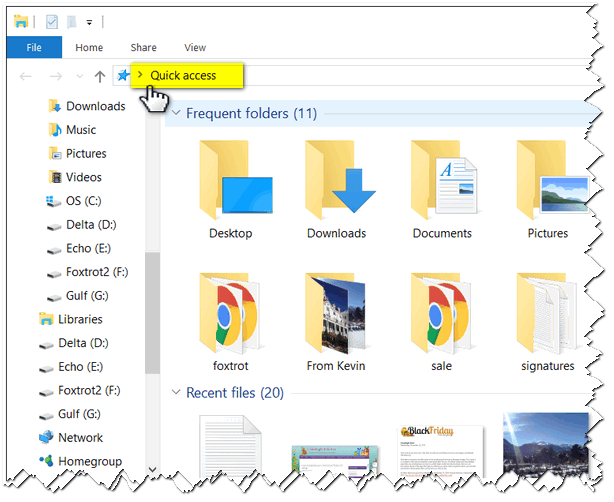 Now you can see your drives as well as your main Quick Access folders. If you preview this view, then you’ll love this tip. My friends, now you know how to make File Explorer open to “This PC” in Windows 10. And remember old timers, File Explorer was formerly known as My Computer and Computer. 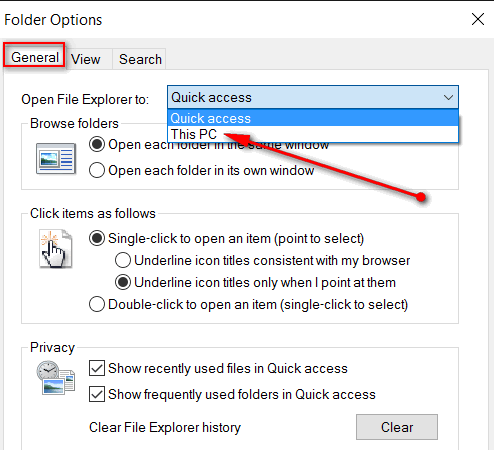 If you get tired of a more traditional File Explorer view and want to go back to seeing only your Quick Access items in the default File Explorer view, justfollow the steps above and select Quick Access instead of This PC in step 3 above. PS: You can pin things you use often to Quick Access. It’s cool. We’ll cover that later. OK? Thanks for a great tip, don’t have to go through these shenanigans with other Windows Operating systems. Eh?